The Department of Animal Sciences is honored to have five of the 25 CFAES Distinguished Seniors. Seniors Anna Garrett, Heather Pechtl, Ariel Taylor, Megan Whalin, and Emily Winson were awarded the honor. 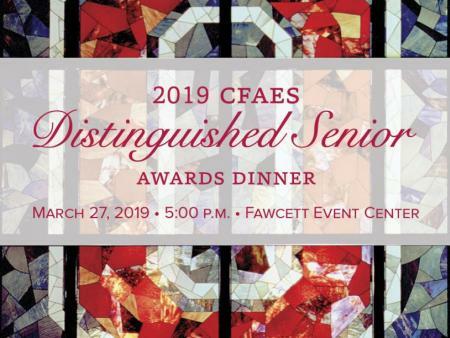 All 25 award winners will be honored at the 2019 CFAES Distinguished Senior Awards Dinner at the Ohio State University Fawcett Event Center March 27. The CFAES Distinguished Senior Award honors academic, disciplinary and professional excellence. Anna Garrett is an animal sciences major from Cincinnati. Through her honors research projects, she first studied the impact Goddard’s Law has on animal cruelty cases, then aided in the construction of behavior ethograms in dairy cattle chronic pain research. Garrett has been heavily involved in the animal welfare judging team where she researches welfare issues, production practices, and ethical considerations before evaluating welfare scenarios, providing reasons that defend her choices. She’s been very successful on the team, winning the annual Intercollegiate Animal Welfare Judging/Assessment Contest in 2017 and placing in the top three in 2018. “She is a stellar student, has a tremendous work ethic, and automatically becomes the leader in group projects. Outside the classroom, Anna has a passion for serving others,” Benage noted. As a member of the Animal Science Community Alliance (ASCA), Garrett has served as a teaching assistant and mentor and has been very involved in leading the Science Club at Cristo Rey High School, a college preparatory school for low-income minority students. This biweekly commitment gives her the opportunity to show the students support and to encourage them to pursue their love for science. Garrett has also made an impact through the OSU Animal Welfare and Behavior Club. Taking on leadership roles as its secretary and vice president has allowed her to create professional development activities for members of the club and the community. After a life-altering trip to South Africa, she joined the CFAES Voyagers team to advocate for international experiences. As a departmental recruiter for the Department of Animal Sciences, Garrett’s passion for animal science and OSU is evident as she provides tours to prospective students, leads hands-on events, and communicates with admitted students through emails, postcards, online chats, and phone calls. After graduation, Garrett plans to pursue an Ohio State master’s of public health degree with a specialization in veterinary forensic science before continuing on to veterinary school. Heather Pechtl is an Animal Sciences major from Mundelein, Illinois. Petchl also gained an appreciation for how history, government, geography, and infrastructure can impact cultural development and the use of land and animals within our societies. After touring a family farm in Nicaragua and connecting with the family, she pursued an opportunity to complete an independent research project with her own experimental design studying the impacts of human-animal interactions and societal factors on the welfare of animals on their farm. She even learned to speak Spanish fluently enough to converse with the family over Skype. After finishing the project her second year, Petchel began two new research experiences in the department, which she is continuing to complete for research distinction. “I am truly amazed and inspired by the courage, initiative and drive Heather has in pursuing what she is most passionate about studying: animal welfare. In fact, Heather helped get the Animal Welfare and Behavior Judging Team off the ground in her tenure here, which has placed in the top three at several regional competitions,” noted Benage. Petchl is a leader and as a member of the Animal Welfare Club, the Animal Science Community Alliance (ASCA), provides tours to prospective animal sciences students, and communicates with admitted students through emails, postcards, online chats, and phone calls. She co-chaired a committee to plan and implement the largest CFAES student event, the Back 2 School Bash, managing a $25,000 event budget and creating the nearly 100-page audit for reimbursement. In addition, Petchl is a Morrill Scholar mentoring at-risk youth, has participated in BuckeyeThon, served as a trip-lead for Buck-I-Serv, and served as a teaching assistant and course mentor. She was also involved in a new program ASCA created with a Columbus college preparatory high school, Cristo Rey, to offer a science club with engaging hands-on activities. “She is extremely selfless and truly embraces diversity and appreciates people for who they are regardless of background or status; she is compassionate to all, which is one of the many reasons why Heather was one of 24 students inducted into our prestigious SPHINX Senior Class Honorary this past spring,” wrote Benage. After interning with Humane Farm Animal Care, Pecthl was offered a full-time position. After graduation, she plans to work with the organization for two years while obtaining a master’s in animal welfare, ethics and law from the University of Edinburgh, Scotland. Afterwards, she intends to pursue a PhD in animal welfare and behavior. Ariel Taylor is an Animal Sciences major from Medina, Ohio. Taylor’s efforts in creating, launching and coordinating the efforts of the Best Food Forward team resulted in her recognition as a Stamps Leadership Scholar, given to five Eminence students based on leadership qualities and dedication to service. Taylor served as a two-time president of the Animal Science Community Alliance (ASCA), chaired the planning committee for the Department of Animal Sciences’ largest event, the Winter Mixer, and took advantage of education abroad opportunities in New Zealand and Chile. She has been a teaching assistant and mentor to animal science students, served on the planning committee for the CFAES Back 2 School Bash, and was selected as one of 24 students to be part of SPHINX Senior Class Honorary. As a departmental recruiter for the Department of Animal Sciences, Taylor provides tours to prospective students, leads hands-on events, and communicates with admitted students through emails, postcards, online chats, and phone calls. She also helped create a science club and interactive activities for Cristo Rey, a new Columbus high school for at-risk youth. Taylor’s passion lies within food supply medicine, safety, and security and many of her collegiate experiences have been within the overlapping fields of animal and human health. After graduation, she will attend The Ohio State College of Veterinary Medicine with the goal of becoming a swine veterinarian. After a chance meeting with the CEO of Smithfield at a conference, she was invited to complete an internship with them in hog production. She made such an impression during her internship, that Smithfield has pursued her to be part of its team once she graduates from veterinary school. Megan Whalin is an animal sciences major from Stockport, Ohio. As director of volunteering for the OSU Buckeye Food Alliance, Whalin’s work benefited the community by ultimately providing greater access to food by OSU students who face food insecurity. As a Morrill Scholar, she became a mentor for first-year Morrill Scholarship Program students and encouraged them to become involved in diversity and inclusion on campus. "Megan is one of those students that excels in so many categories, wrote her nominator, Maurice Eastridge, professor and Extension dairy specialist in the Department of Animal Sciences. “She is a stellar student, has a tremendous work ethic, and automatically becomes the leader in group projects. Outside the classroom, she has a passion for serving others,” he noted. Whalin has worked with various organizations to promote food security for the OSU campus and Columbus-wide community. She delivered snack packs to Head Start programs through Buckeyes Against Hunger and worked to prepare a garden for the Columbus refugee community though Students for Refugees. She enhanced the educational experiences of Columbus children by tutoring in a Students for Refugees after-school program, and volunteered at the Mid-Ohio Food Bank and OSU’s on-campus food pantry through the Buckeye Food Alliance. Emily Winson is an animal sciences major from Port Clinton, Ohio. Winson served as an undergraduate teaching assistant for both the Animal Biosciences Laboratory and the Introduction to Animal Sciences Laboratory. Passionate about building community, she is a member of the Animal Sciences Community Alliance (ASCA) where she was involved in multiple facets of the organization, helped to plan Back2School Bash for nearly 1,000 CFAES students, staff, faculty, and administrators, and mentored/recruited high school students. Winson also mentored potential Cristo Rey first-generation college students through the college application process while helping them understand special programs and scholarships they’re eligible for to make their collegiate experience more affordable. “Emily has been an instrumental member of ASCA and led engaging hands-on activities for a science club at Cristo Rey Columbus High School, a college preparatory school for low-income minority students. She has led the club in dissecting sheep hearts, creating a genetically diverse population via gummy bears, and electromyography competitions just to name a few,” Benage noted. As a member of Alpha Chi Omega sorority, she served as a recruitment guide for two years and assisted with membership and retention for the Panhellenic Community. Additionally, Winson rode on the OSU Hunt Seat Equestrian Team for two years, participated in BuckeyeThon, was a member of the Health Sciences Scholars Program, worked with Habitat For Humanity in Birmingham, Alabama, and studied abroad on the European Dairy Industry trip. She also completed three internship experiences, one of which was at the Center for Courageous Kids in Kentucky where she worked as a counselor for campers battling serious illnesses or handicaps. Winson also found time to be involved in research. As a research assistant in a poultry gut health and immunology laboratory, she researched ways to better the health of commercial broiler chickens. Her project has been submitted to a journal for publication, and she presented her research at the International Poultry Scientific Forum which will give her an opportunity to graduate with research distinction. Upon graduation, Winson plans to run from San Francisco to Boston with a group of 20 college-aged students to raise money and awareness for young adults with cancer for the Ulman Foundation. The trip will last 49 days and Winson has pledged to raise $4,500 for the cause. In Fall 2019, she will begin her first year at The Ohio State University College of Veterinary Medicine.